The cover of the Voynich MS is of blank parchment that does not have any indication of its origin (year, title or author). 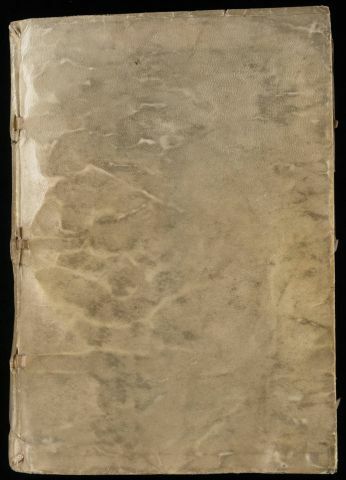 The >>Beinecke library description of the Voynich MS calls the cover of the MS a limp vellum cover of the 18th - 19th C. This tells us that the cover is not original to the MS, and in all likelihood replaced an earlier cover. In July 2014 eraser crumb samples were taken from approximately 10 places in the MS, and on my recommendation also from the cover. These were sent to a team of the University of York in order to identify the species of the animal from which the parchment was made. This is achieved by extracting protein from the samples and matching them with samples from known species (1). While for all folio samples the species was identified as 'cow', the cover sample could not be matched to any species. However, in November 2014 the professional parchment maker Jesse Meyer of Pergamena identified that the cover parchment is made of goat skin (2). While the cover is described as a limp cover, this is not what it was originally made to be. It used to be stiffened by filling materials. The cover also shows remnants of paper pastedowns (see right-hand picture above) that have been removed. The pastedowns and the filling materials were most probably removed by Wilfrid Voynich himself, shortly after he acquired the MS. Possible reasons for this are explained below. 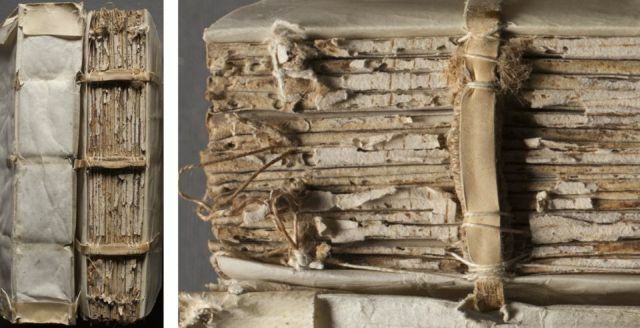 These images clearly show the common type of binding. This rebinding is briefly mentioned in the catalogue of Vat.Lat. 11414-11709, written in 1959 by Mgr. J. Ruysschaert (5), where we read that many of these manuscripts have been rebound by the Jesuits of the Collegium Romanum, though he does not indicate that this concerned almost the complete collection. Thus, we know that the present cover of the Voynich MS was added (presumably replacing an earlier one) by the Roman Jesuits, i.e. after the MS was received by Kircher. There are insect holes in the first and last folios of the MS. As pointed out by the conservators who inspected the MS for several hours in the Folger Library in Washington in November 2014, these insects are not at all interested in parchment, but in wood. This led to the conclusion that the original binding of the MS almost certainly had wooden boards. The woodworms just nibbled at the first and last pages and the location of the wormholes matches well with the places where the insects could move in and out of this cover. From discolouring on the first and last folios it was furthermore concluded that these wooden boards were covered by tanned leather (see note 2). Interestingly, Manfred Staudinger, who has researched the account ledgers of Rudolf II preserved in Vienna, once remarked that the Voynich MS could hardly have been owned by Rudolf II, because it should have had a very different binding. This objection has now been explained. 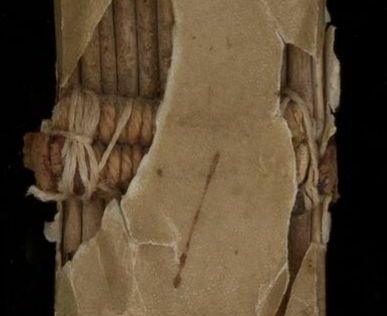 Research performed by staff of the Historical Archives of the Gregorian Library in Rome has been recorded in their blog (6), and this tells us that the MS collection was described, sometime in the 18th Century, as “old books infested by worms”. The manuscripts were subsequently sent to a binder, where they were rebound. The Boccaccio MS seems to have undergone a similar fate, as it has quite similar insect holes as the Voynich MS (7). [Voynich] knew that when a book is bound in vellum it may hide in its heart unexpected treasures. Hence it was reserved for him to make the quaintest and most valuable discoveries in the backs of the old bindings. Voynich never discards a book until he has stripped it of its cover. Here often the most priceless finds are made - a fact few even among book lovers know. For in the days before commercial cardboard was known, to stiffen the backs and sides of a book everything that was available was used and pasted together to make a compact mass. Hence the binder packed in much then held mere waste stuff, now often worth its weight in [5-pound] notes. 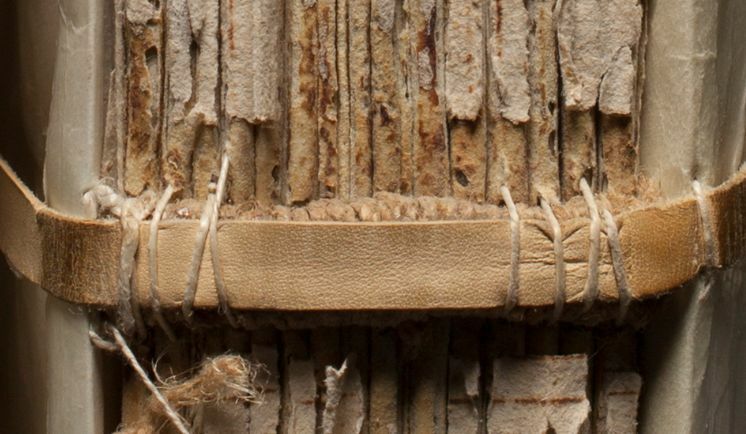 This shows a combination of binding details from different ages. 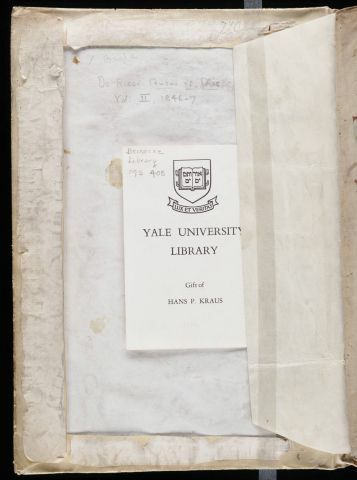 This includes also modern repairs, from the time that Kraus owned the MS, as described on the inside back cover (see also below). The leather thongs, clearly visible in the above pictures, were added on this occasion, and glued on top of the older flax fiber thongs. This was a repair made in order to stabilise the binding. The white thread visible in these figures also dates from the same repair. There are remanants of an old paper lining, and the conservators also detected very tiny fragments of leather attached to this area. This single example is insufficient to draw any definite conclusions, and Yale library experts are not convinced that the similarity is that great. Still, it does keep open the possibility that the Roman Jesuits made a more thorough rebinding of the Voynich MS than previously assumed. Records of the repairs to manuscripts in the Collegium Romanum library have been preserved (12), and further research can still cast more light on this question. The handwriting is different for the three items. The code 'J 1022' is similar to annotations found in one other MS once owned by Voynich (13) and this is almost certainly one of Voynich's internal catalogue references. Since it is written on top of the remnants of the torn out pastedown, it was definitely written after the MS changed ownership from the Jesuits to Voynich. The 'Bsafe' entry was made by H.P. Kraus (14). This is a type of shelf mark he reserved for his most valuable items. The last entry refers to the description of the Voynich MS in De Ricci (1937) (15) and must therefore have been made after 1937. The handwriting is undoubtedly that of Anne Nill. The abbreviation HLH refers to Hellmut Lehmann-Haupt, a famous bibliographer who was also a consultant to H.P.Kraus (16). This describes the repairs made by them, that were already mentioned above. Below the number 7484 at the bottom there is another erased item, and this is a combination of a stock/inventory number by Kraus, and an erased price code (see note 14). A description and examples of the application of this technique may be >>seen here. As reported also in Zyats et al (2016). These two manuscripts are identified as J30 and J17, respectively, in this table. The link between this collection and Voynich's larger acquisition that included the Voynich MS is explained in detail on this page. In particular the following blog entry in Italian: >>Corpi di libri antichi da mandare al legatore. Already remarked some years ago by Ellie Velinska. See Zimmern (1908). I am greateful to Rich Santacoloma for the reference. When I was, in May 2012, in the Italian national library in Rome (BNCR), the very helpful curator of manuscripts Dr.ssa. Breccia suggested that I consult one of the manuscripts in the Fond Gesuito, which I did. I did not find any reference to the Voynich MS. Had I known then, what I know now, I would have paid it significantly more attention. A revisit of this document is high on my list of things to do. Discussed in the course of this page. I am grateful to Peter Kidd for this information, and can refer to his >>web page describing Kraus' markings in manuscripts he owned. I am grateful to Mr. D. De Simone of the Folger Shakespeare Library (formerly curator of the Rosenberg collection in the Library of Congress) for this information.